Is your Academic Department Getting the Most Out of its Marketing? Thousands spent on traditional mailer campaigns. Countless hours spent printing, packing and sending department-produced newsletters or magazines. How many are dumped in the recycling without being opened? Every academic department with a serious interest in promotion needs to ask itself – is that investment of time and money really worth it? In a word – no. We live in an increasingly digital age, and although some industries continue to do things the old-fashioned way, paying to produce a mail a hard copy newsletter or magazine just isn’t efficient anymore. We’ve created Cureus Channels as a way to fill this void while taking full advantage of all the latest and greatest digital technology. 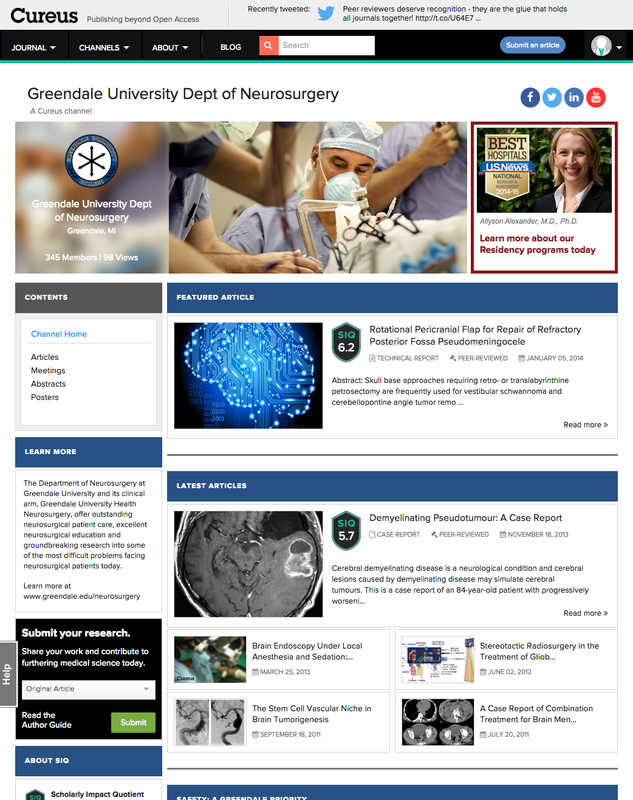 Your department’s custom, branded Channel homepage serves as the one-stop shop for all of your latest published research and clinical experiences, as well as departmental news, media, event info and more! What’s more, we’ll also send out a branded quarterly email digest highlighting some of your latest articles and their authors. We work with you to fashion each quarterly digest to your liking – you pick the articles and authors to feature and supply a short introductory message and we take care of the rest! Promote up-and-coming faculty, gain referrals and raise your department’s profile throughout the medical research community with a Cureus Channel. Contact me today at graham.parker@cureus.com to learn more. Publishing with Cureus for the first time? Check out our new how-to videos!